How comparable is my soil carbon data with other soil tests? At this moment, comparing and sharing soil carbon data is not easy. This is because the methodologies are so varying, and collection methods are so different. In an ideal data analyst’s world, we’d collect standardized data from each farm’s paddocks and make comparisons of grazing practices that increasing soil carbon. Unfortunately, nature is rarely standardized. We interviewed Dr. Rebecca Ryals at UC Merced, one of the leading scientists who worked with Dr. Wendy Silver on soil carbon measurements at the Marin Carbon Project. Dr Ryals explains that there is quite a lot of variation and dispute in the scientific community for how to measure soil carbon stocks. Time. The typical minimum timeframe for resampling is three years for soil carbon testing. If you are rapidly building up more soil during that time, it’s challenging to ensure that we are sampling at the same depth and comparing apples to applies. Maintaining similar sampling depth. Soil grows “up” if you’re building more organic matter. The Bulk Density method is the “classic” method of measuring % of carbon in a given sample, bulk density, and height of the sample. According to Dr. Rebecca Ryals, this approach is simple to measure in theory, but difficult in practice. As any soil farmer knows, bulk density, or how “fluffy” the soil is, varies widely. If grazing management practice is changing, the bulk density or “fluffiness” of the soil may also be changing. Tillage or no-till has a huge impact on the bulk density of the soil due to compaction. Furthermore, as soil builds, it tends to grow “up”, so it’s hard to compare apples to apples over a multi-year period. Dr. Ryals mentions the Equivalent Soil Mass method as a more promising approach, which doesn’t need bulk density, but uses the exact mass of soil in a sample(removing things like rocks), and compare the carbon stocks in that sample. Carbon stocks may be changing further down than initially measured. It turns out that Mother Nature is doing work where we weren’t even looking. The work of Dr. Christine Jones, Midwest farmer Gabe Brown, the Land Institute, and others also support these findings. They have found over multiple years of measuring the top 30 cm of soil may be greatly underestimating the change in carbon stocks. Changes in soil carbon stocks have been measured as deep as 4-12 feet. This makes sense, as the roots of perennial grassland plants can get to 12 feet depth or more. Different soil data collection tools give different results. A recent published study from the University of Alberta by graduate researcher Cole Gross showed that the tools of measurement of soil carbon stocks don’t give the same results. This means that soil carbon data may vary based on the collection method. The three common soil gathering methods are clod, core, or excavation. Clod is sending a clod of soil from your pasture surface or certain depth to a lab. Core sampling involves pounding a hollow tube into the soil to extract soil. Excavation involves digging a large soil pit and is the most accurate. How can we make soil data easy to compare? Don’t lose hope! Point Blue Conservation Science, PastureMap, and other organizations are building a future where soil carbon data can at least be shared with your team, your neighbor (maybe), and with like-minded folks in your community. Point Blue Conservation Science's Rangeland Monitoring Network allows any research team to take consistent soil health tests measuring water infiltration, bulk density, and 54 other indicators. The PBCS team has taken samples from 85 ranches around Northern California. The RMN handbook also includes protocols for taking measurements of bird and vegetation diversity. At PastureMap, we’re making soil carbon data visualization possible on our mapping platform with Point Blue Conservation Science. Layer grazing records over soil data: We’re layering soil carbon data from ranchers in California to overlay with their grazing records. 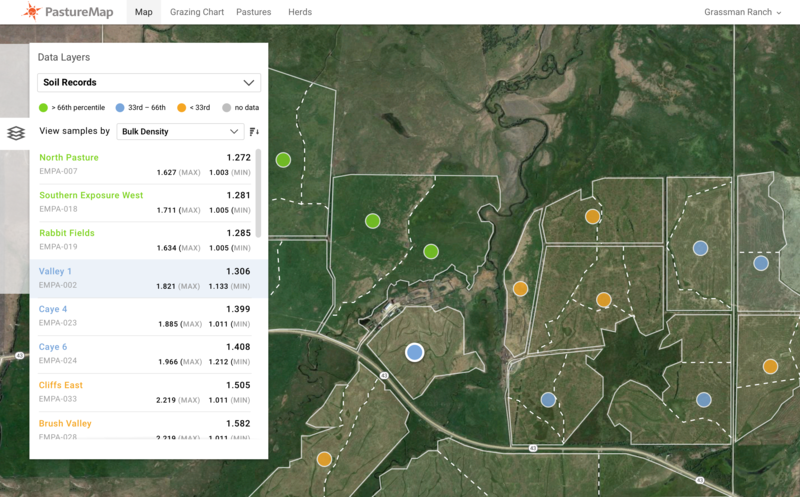 This will enable producers who are keeping grazing records in PastureMap to see their Point Blue soil data in our visualized, map-based platform, and see how their grazing management is affecting soil health. Compare similar pastures. Different slopes, terrain, and soil types have different soil carbon sequestration potential. You can use PastureMap to see the USDA soil types to make sure you're comparing pastures that are similar. Track change over time. It takes 3-5 years, or even 7-10 years to see significant changes in soil carbon. Tracking changes over time over multiple years is important, instead of just one snapshot in the middle of one season. Look at multiple indicators. Soil health isn't just a carbon or soil organic matter number. Changes in bulk density indicate how compacted your soil is, which could be affected by length of grazing periods. Improvements in water infiltration. PastureMap's soil health data partnership with Point Blue Conservation Science will show multiple soil health indicators that can provide a holistic picture of what's going on with ranchers' rangeland health. Our data visualization doesn't solve all the data challenges of soil health measurement, but it's a start. Here are other folks doing great work to make soil carbon data comparable and shareable. Dr. Ryals and her research team at UC Merced are working on an initiative to combine soil research databases and come up with scientifically robust ways to convert soil sample data from various studies into larger data sets. QuickCarbon. Mentioned in our previous post, this is a handheld soil reflectometer technology developed by Yale School of Forestry - Ucross High Plains research team. It uses spectral imaging from a pocket handheld device, a phone app, and a power drill to quickly sample a large number of soils samples. The Yale team then builds a model using the collected data set and a few of the actual soil samples sent to a lab to calibrate the samples. The end result is a visual “tapestry” of the soil carbon stocks on your land. This methodology is being tested as a easy way to scale up baseline collection methods, along with Point Blue Conservation. The Soil Carbon Coalition Handbook by Peter Donovan is another great primer on how to take accurate soil carbon samples. Under the Soil Carbon Challenge, anyone can use these methods and upload their soil data results into Atlas BioWork, an open source platform. So far 300 farms have participated in the Soil Carbon Challenge in partnership with Peter Donovan. Soil Carbon Cowboys: Peter Byck's work is more than films. Arizona State University is leading a scientific project to gather regional baselines of soil data and measure change in soil carbon in a robust way. Peter Byck’s short films are wonderful introductions to bring soil carbon curious consumers onboard with regenerative farming. We know that it’s difficult to talk to neighbors. But many of your neighbors are soil carbon curious but “too polite to ask”. Given the hyper-regional nature of grazing and soil data insights, your neighbors are the actually the most likely people in the world to benefit from your soil carbon insights. Consider sharing this Soil Carbon Curious series in your newsletter or Facebook / Instagram as a first step. Know any other soil data sharing networks we should be aware of? Get in touch! Stay tuned for Part III of Soil Carbon Curious: when can farmers and ranchers get paid for sequestering soil carbon?